Belinda Bencic will play her first competitive singles match since Wimbledon against Timea Babos in the second round of the Western & Southern Open in Cincinnati on Wednesday. 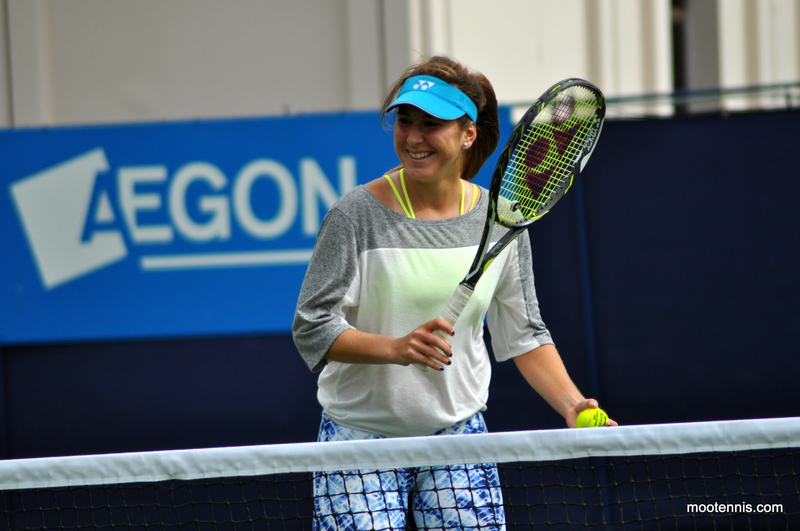 For Bencic, it’s been an injury-ravaged year which had promised so much with a very encouraging start. Bencic cracked the top ten back in February by virtue of reaching the second week of the Australian Open and the final in St. Petersburg, her fourth WTA final. However Bencic went onto lose six of her next seven matches, eventually pulling the plug after Charleston and withdrawing from the clay court season due to a back injury. Bencic returned on her beloved grass but a slip in Birmingham resulted in another injury and withdrawal. After an early exit in Eastbourne, the Swiss player looked rejuvenated and back to her best at Wimbledon where she produced a dazzling display in her first ever appearance under the Centre Court roof to beat Tsvetana Pironkova in the first round for the second straight year. As optimism rose, another injury thwarted Bencic… this time it was the wrist. The 19-year-old was forced to pull out of her second round match at SW19 to Julia Boserup. The wrist injury meant that she was unable to defend her Rogers Cup title in Canada or compete in her first Olympics in Rio… rough luck :-(. Babos is having by far and away her best year on tour in terms of singles. The 23-year-old enjoyed her 30th win of 2016, beating Louisa Chirico in the first round, 6-4 6-4. It was a pretty tight match with Babos a touch more powerful from the baseline and more effective behind her first serve. Babos has had her moments closing out sets and matches this year, but served out both sets against Chirico at the first time of asking to 0 and 30. Head-to-head record: In their only previous match, Bencic defeated Babos in the second round of the Australian Open, 6-3 6-3. Interesting stats: It was this time last year when Bencic began to soar up the rankings and score big wins. Being unable to defend ranking points due to the injuries, she has had a significant drop in the rankings to 27. For Babos, she’s enjoyed a consistent slate of singles results where she has lost her first match at just six out of her 21 tournaments in 2016. Final thoughts: For Bencic, there’s likely to be some rust as she had a bye in the first round. She was sporting strapping in her first round doubles match with Kirsten Flipkens on Monday (l. to Bertens/Larsson, 4-6 1-6) so the most important thing about this match will be coming through unscathed! Bencic came back with a bang from a lengthy spell on the sidelines in ‘s-Hertogenbosch earlier this year, reaching the semi-finals, so don’t discount Bencic just yet from this one! However… Babos looked very secure in her first round win over Chirico and is vastly improved since their last encounter in January. If Bencic’s level isn’t quite there, Babos has enough quality to prevail. Great to have you back, BB. You’ve been missed! August 16, 2016 in Babos, Bencic, Cincinnati, WTA. Definitely a shame for Bencic with all the injury woes just as she had momentum to go top five and potentially be the one to finally give Serena a run for her top ranking.